Wait, so am I allowed to step on the logo or not? 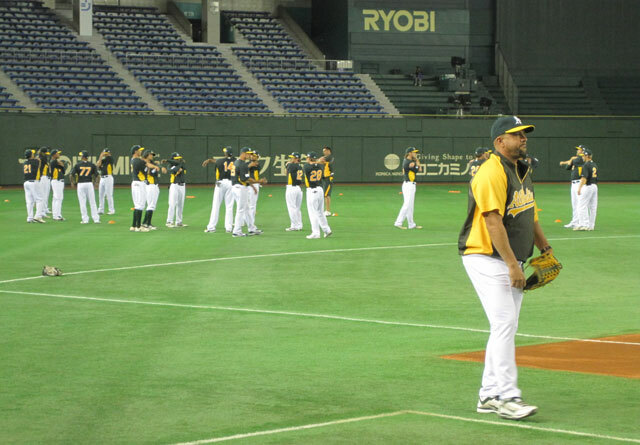 TOKYO DOME — Saturday was a workout day for both the A’s and the Mariners — a chance to get acquainted with the Tokyo Dome and make sure they didn’t forget how to swing and throw on the flight over. What actually goes down at a workout day? First, there’s the hang out. Players get dressed in the clubhouse, then trickle into the dugout where they stand around waiting for something to happen. Also, everyone goes through elaborate greetings like they haven’t seen each other since last September. Note: These guys spent 12 hours together on a plane yesterday. Don't be fooled by the casual attitude. There are actual calisthenics going on here. Once everyone is uniformed and reacquainted, it’s time for stretching. The key to a good stretch is to actually get loose while appearing to expend the smallest possible amount of energy. There’s plenty of grunting, groaning, arm flailing and backwards jogging. I-right wiggle, 34-switchlade on three. Ready ... break! After warming up comes the actual baseball part. Pitchers throw long toss and work on mechanics in the outfield. Infielders take ground balls from coaches. Outfielders shag flies. Everyone rotates into the batting cage. 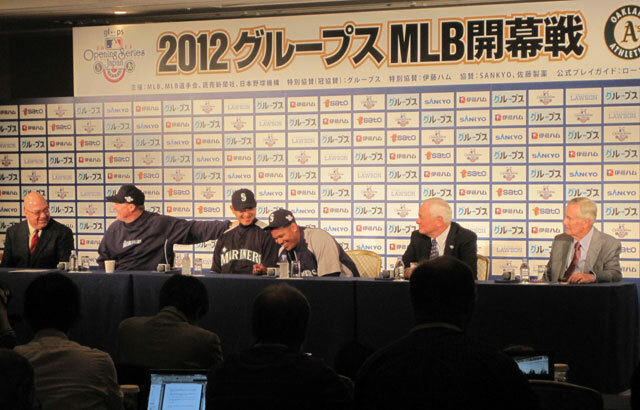 Mariners third base coach Jeff Datz is a brave man. That screen got a workout today. The whole exercise is choreographed chaos. Between players, coaches and staff, there are upwards of 35 people on the field and probably five balls in the air at any given moment. I kept waiting for someone to get beaned by a liner or a relay throw. Turns out, these guys know what they’re doing. 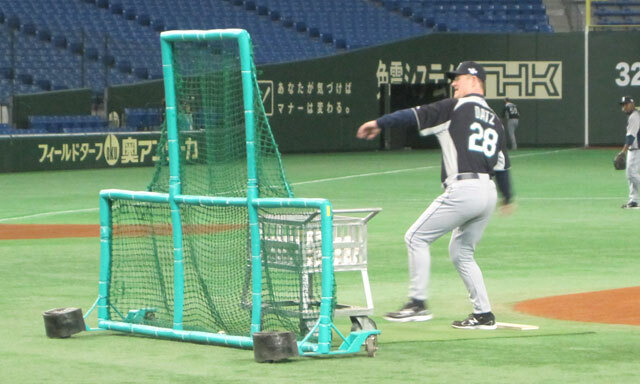 Highlight of the day: Mike Carp pulling a BP homer off Shigeo Nagashima’s retired No. 3 in right-center field. See the SECOM billboard in the photo below? He hit the pillar below that. My professional scouting background indicates that’s significant power. 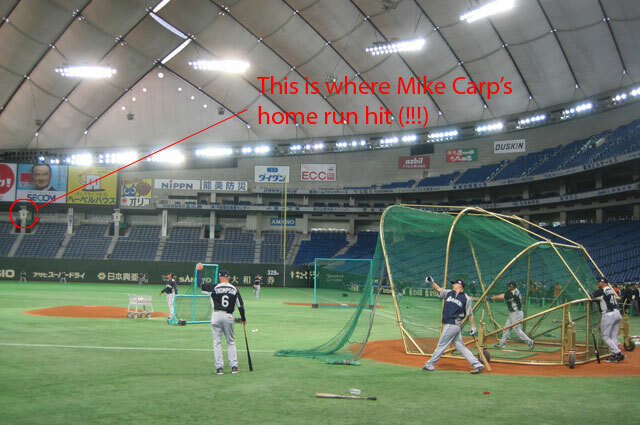 Ten megapixels is not enough to fully comprehend Mike Carp's power. Love all the pictures and blogging, please, keep it up the good work! Pete, Your attitude about stpyamhy is spot on. I don’t know where you get your wisdom at 27 because the people that I have dealt with in the past 30 years have all been older than you. I’m willing to help because, from what I saw on TV, you have a sound support system and your attitude is to not give up , which most people in your position would do. I is astounding how many people will accept a doctor’s prognosis of go home and clean up your affairs because the future is dismal. I can help, not by intervening with you or your medical care but by educating you on how you got were you are and steps to take to stop the progress. I don’t guarantee anything but hope and a good fight that you will remember for the rest of your life (which will be long and prosperous if you are willing to pay attention). By the way, I don’t accept money or thank you s for what I do. I’m not touchy, feelie or any other kind emotional displays that dumb people think is appropriate. I do expect you to pass on the information that I give to you, to anybody that needs it except somebody who has hurt someone that didn’t deserve it.If you don’t want to hear from me again . . . just let me know. I can do that and wish you well at the same time.